Some of you might love a specific color, which is why you want to décor your house with that one color as the main color. Turquoise is a beautiful color it represent the water and sea. It has blue and green shade combination which makes it very unique. You can also have turquoise color in its other tint such as teal and aquamarine. Both of them are also very beautiful selections that you should have. And if you want to use this color theme inside your house, then you must need turquoise home décor items to be used to decorate your beautiful house. Basic home décor items that you need to use are vase and pottery which available in turquoise color. Some of them are made from ceramic or clay so the shade would be darker. But you can also find items made from glass so the color would be lighter. You can place sets of vase around the room to achieve beautiful turquoise theme decoration. You could also add some flowers with different color to tone down the shade a little bit so it would not be too much to use. Light fixture is another thing that you need to use in your house, and there are a lot of turquoise home décor chandeliers that you could use. Those chandeliers are made from beads of turquoise color which is very beautiful. Some also made from turquoise colored glass so it really appears as other chandelier but in turquoise color. 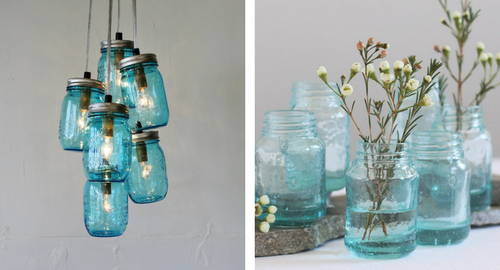 If you want some rustic style turquoise decoration, then you could use Mason jar style chandelier still in turquoise color. You could put those chandeliers on your living room, bedroom and even on your kitchen. Main furniture that you should always have is sofa and chair. The turquoise color would be very beautiful on the sofa and chairs which you could use on your living room and dining room. Mostly you will find plain sofa without any pattern, however for the dining room chairs you might find stripe pattern chair cushion in turquoise color. Nevertheless both plain or patterned sofa and chair has their own beauty. If you want to use turquoise home décor on your bedroom, then you will need this turquoise bedding. You will get the bedding in plain without any pattern, or you can also get it in several other patterns such as flower pattern, wave pattern, zebra pattern, stripe pattern and many others. You can use this bedding on your bedroom your kid’s bedroom and even your baby’s bedroom. This turquoise color will give your room calming effect which will surely make you feel more comfortable sleeping inside. There are a lot of small turquoise home décor items which you could use and add more beauty to your house. Search for wall art which you could use to decorate your bedroom and living room walls. Painting is another turquoise decoration items that is very easy to be found and you could use it anywhere around the house. For your kitchen there are a lot of small craft and kitchen sets in turquoise color which surely will give your kitchen great turquoise color theme. Furniture will give your house a huge change, that is why when you want to create turquoise themed interior, then you must use several furniture in turquoise color. This turquoise home décor could be mix and match with other colors which will make it blend naturally on your interior design. Use turquoise shelf in your home office which match with other wood tone furniture. Use turquoise wardrobe in your bedroom which will surely suits your turquoise bedding. Use turquoise oven, refrigerator, and washing machine in your kitchen, and other furniture around the house. When you want to use turquoise color theme in your house, it does not mean that you should use only one color. You could also pair turquoise color with other color to make it fresher and not feel too much. Use neutral color such as white or gray, but if you want to use turquoise home décor with pink, yellow, red or other earth brown colors.